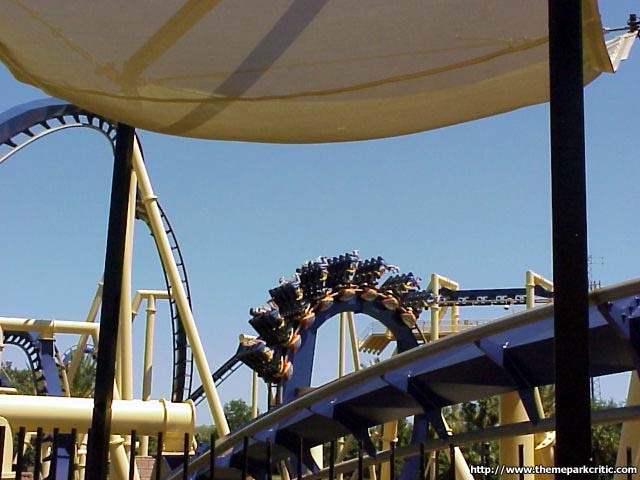 Do not miss this excellent well-rounded inverted coaster. 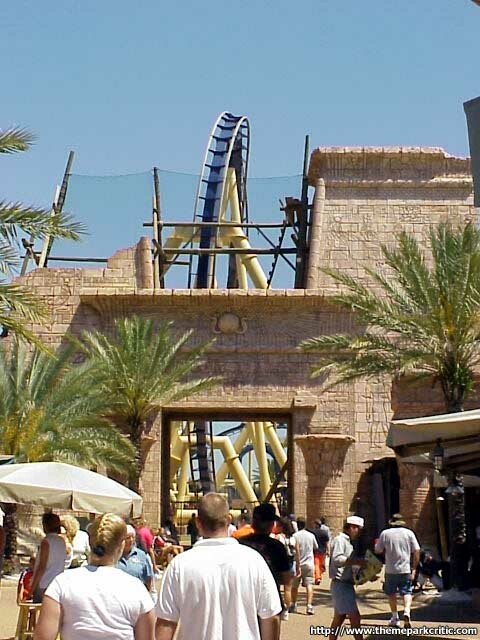 It goes 60mph, 150ft, upside down 7 times, goes in and out of trenches, and it still has room for superb Egyptian theming. 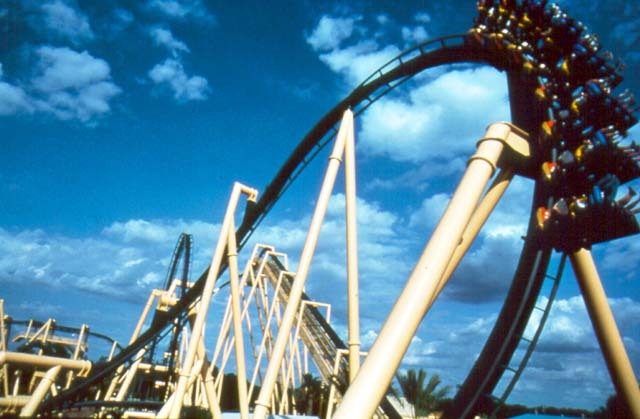 Definately do not miss this GREAT COASTER! 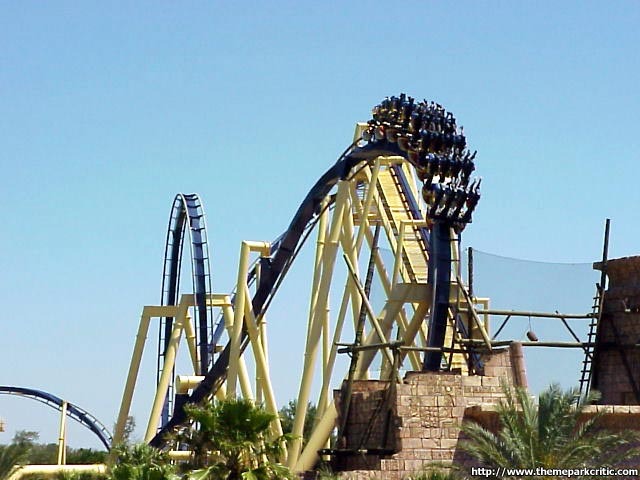 Montu is everything an inverted coaster should be. Sharp changes in direction, high intensity, constant action. A tunnel and several pits add to the effect. The front and back each give a very different ride, both with their strong points. The front provides a fantastic view, while the back feels feels more intense -- i.e. whipping you down the first part of the batwing. Fantastic ride right up to the final brakes = ten! 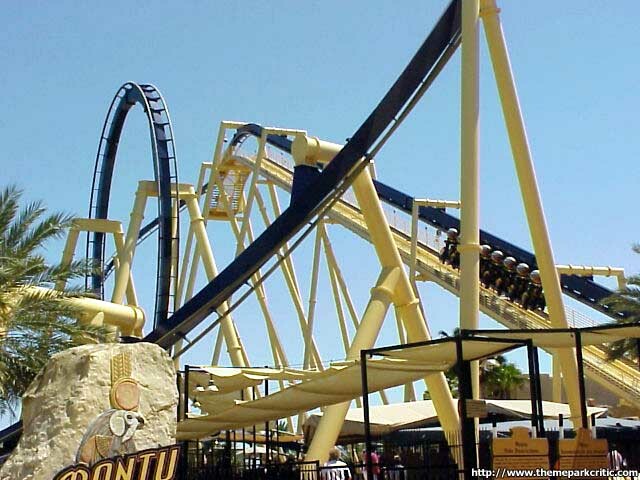 This inverted coaster is diffently the best out there .thereis no other inverted roller coasters out there with the intensity and true smooth force that Montu has.Montu has the worlds largest loop on the inverted coaster at 104 feet.It has two verticle loops slanted at a 45 degree angel known as a batwing wich is pretty wild.a nice inline twist and great smooth corkscrews that will leave you screaming out of your mind.Also last but not least Montu is the worlds largest inverted steel rollercoaster.Also ill give it another title to hold.that is best themeing.Montu themeing is fantastic.big stone egypton walls and the themeing of egypt makes montu fit perfect in its place.If you havent rode Montu yet you have to go to Tampa Florida and excperience the true force of the Montu.this ride deserves a big 10.Just seeing the Montu when you park your car in the parking lot will give a shot of excietment down any coaster critics back. 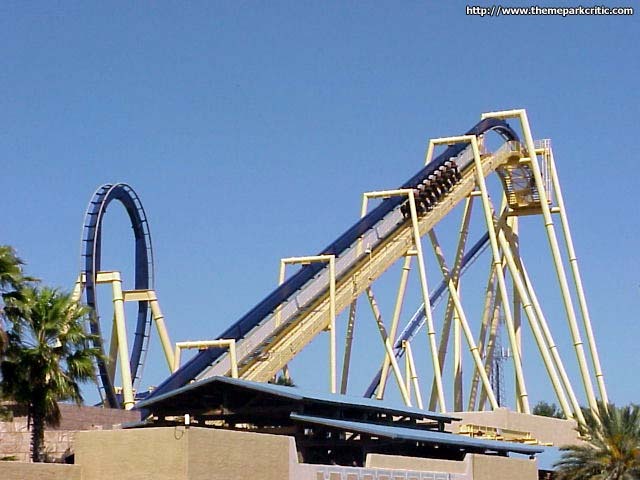 This inverted coaster gets a BIG 10.It has great themeing has loops corkscrews, lots of airtime.Everytime people go into Busch gardens and park there car they see the Montu.Most of the time people say I have to ride that.Also the themeing of this attraction is incredibal.the line is themed with Egyption wall stucture.This has to be the best themed ride in the park.A ride you would want to ride over and over again.Its fast Its intense.Its MONTU!!!!!!!!! Im torn whether I like the ride better than Top Gun: The Jet Coaster so Ill call it a draw. 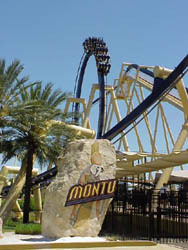 I loved Montu. It was smooth, forceful, fast and intense with good pacing. Every element flowed into another. My favorite part was coming out of the last tunnel into a zero g-roll. 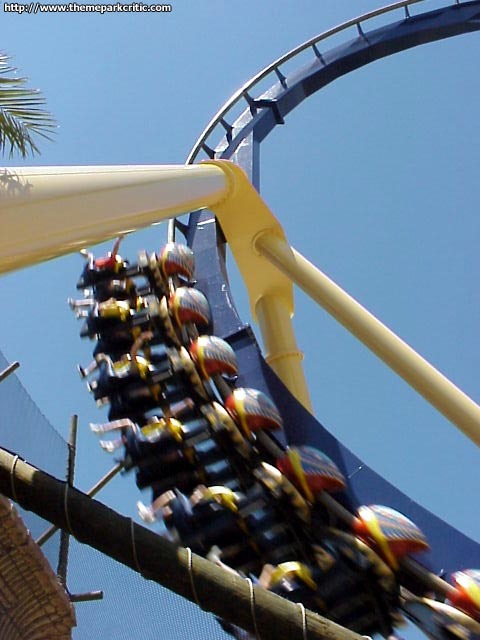 The Montu in my opinion is the best coaster around. 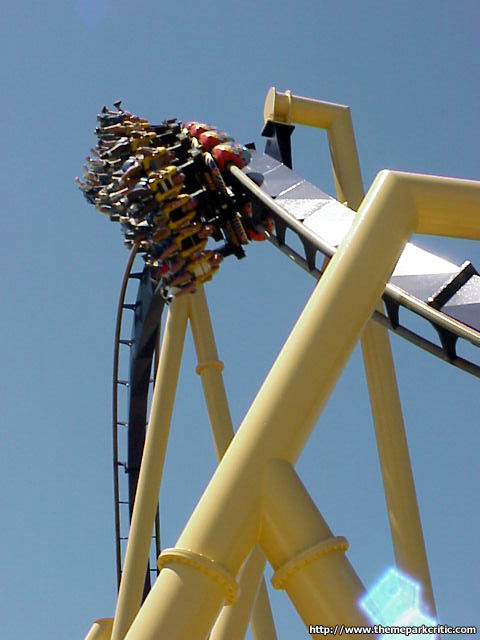 It has seven thrilling inversions, and there is a point in the ride where you pull 3.85 G Forces. It is said to go 60mph, and 128ft in height. I was amazed by...I think the second inversion, the "Immelman" I believe its called. It is the first time I have been on that type of inversion. This is definately a Dont Miss Attraction! 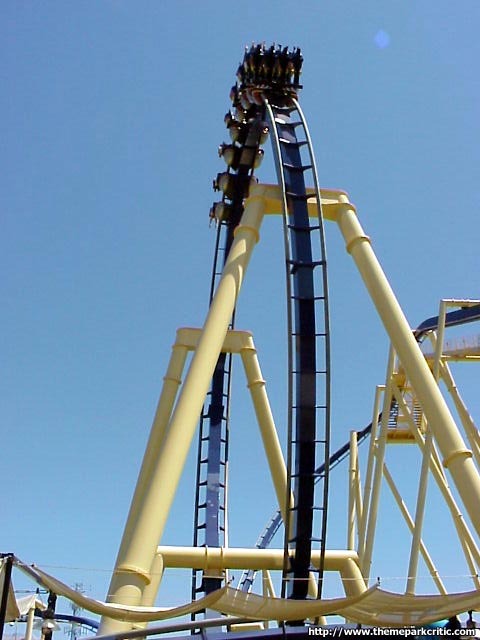 Awesome inverted coaster! 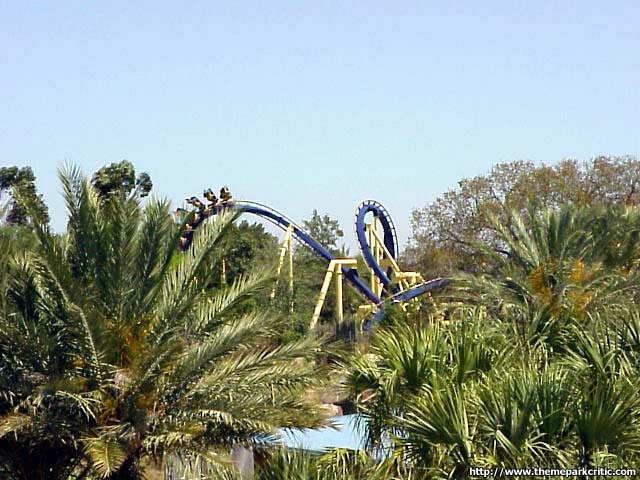 Probably the best in the park and one of the tops in Florida. 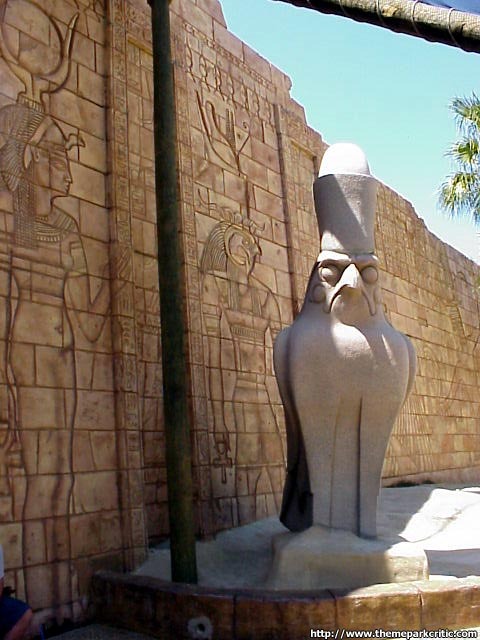 Nice Egyptian theming. 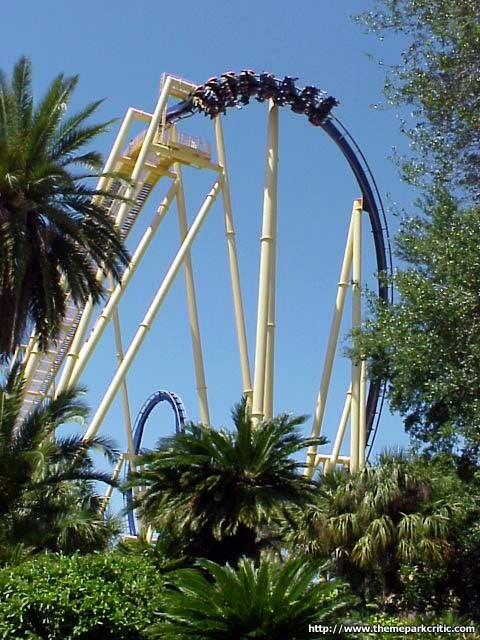 Dont miss this one on your trip to Busch Gardens! 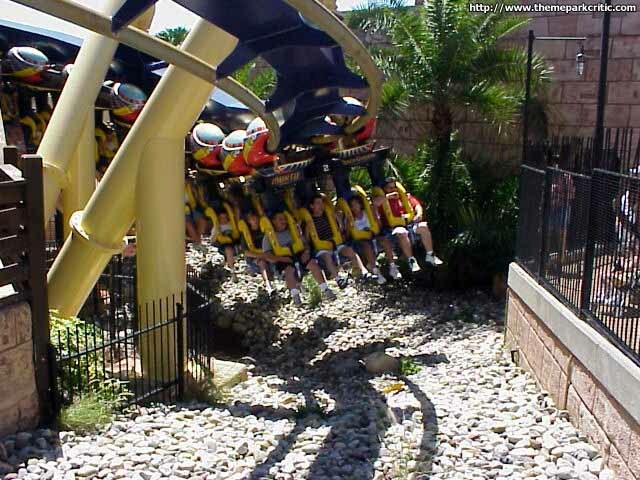 Montu was my first inverted coaster, and it remains the best one I ever rode. 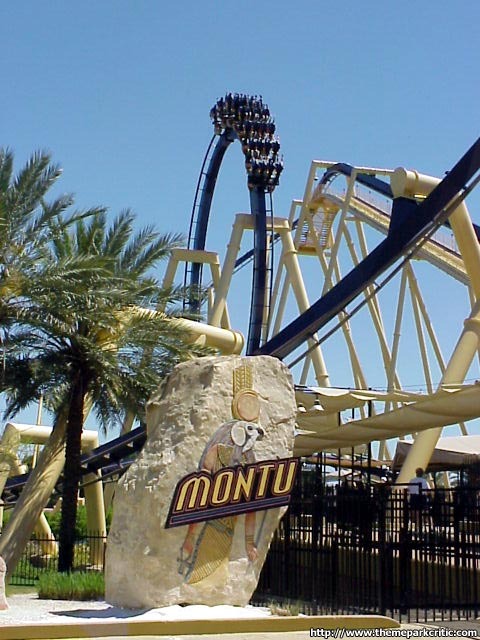 I remember being surprised that there was absolutely no line for the Montu--I took it as a sign that the ride was bad. Obviously my prediction was incorrect. 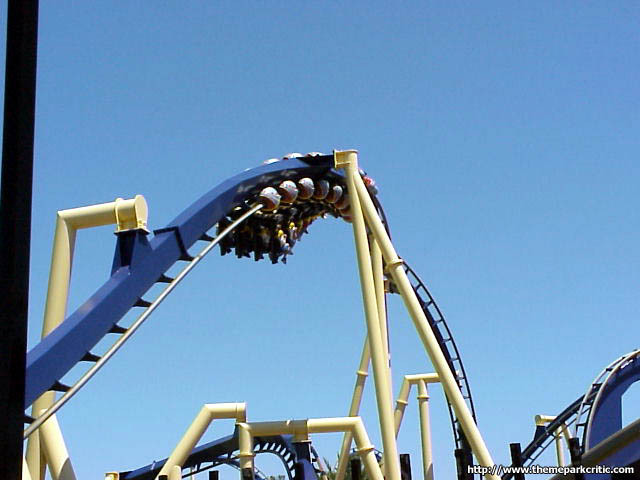 After opting out of Mind Eraser in Six Flags New England because it was supposed to give you a killer headache, I was nervous Montu would be jerky and bang my head around, but the ride was one of the smoothest coasters I have ever been on! The inversions were impeccably timed--a perfect blend between power and agility. My favorite was probably the batwing element. 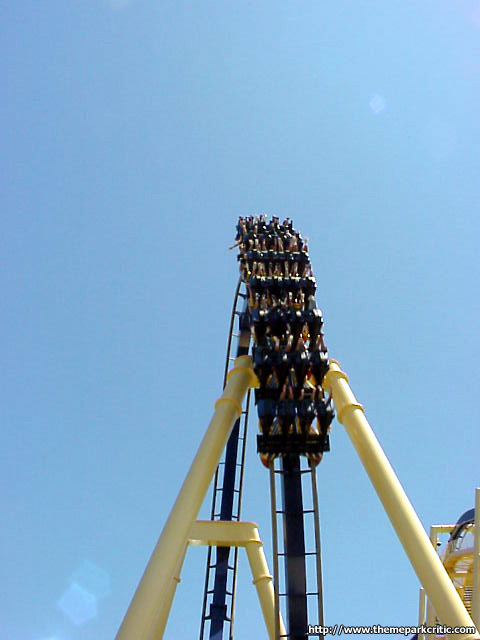 I especially loved how, on inverted coasters such as this one, I rode on the outside of the loops with my legs in the air. That gave a totally different feel to all the inversions--I felt like I was flying! 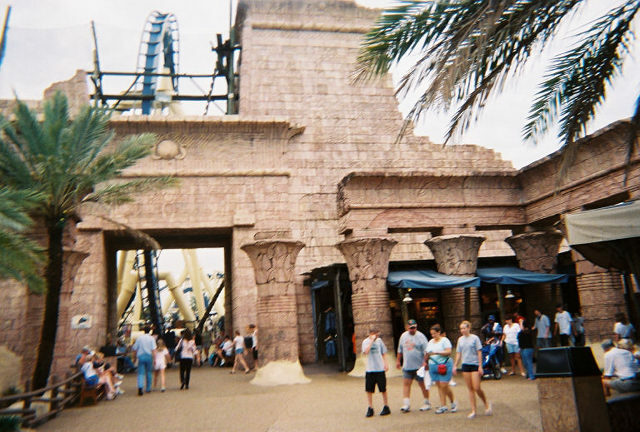 The Egyptian theme was very tasteful and clever--just elaborate enough for you to notice it in between screaming your lungs out, but not so ostentatious that it took away from the ride. This ride is definately in my top ten, and if youre staying in Orlando, definately take the hour trip south and try out this amazing coaster!